Fall is my favorite time of year and with Fall comes delicious comfort foods! There is nothing like sitting down with the family at dinner time and having a heartwarming meal. 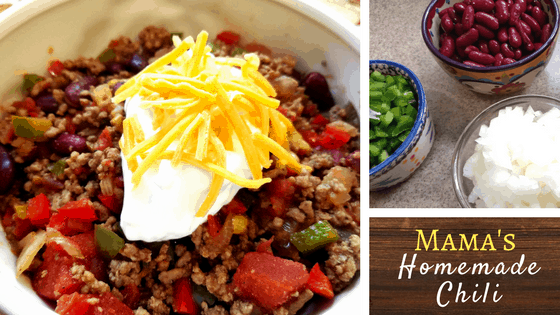 This recipe for Mama’s Homemade Chili is sure to warm not only your hearts but also your bellies. The best thing about this seasoning mix, other than the taste 😉 ) is that it doesn’t have any unnecessary ingredients unlike the packaged mixes. It’s also cheaper, too! I use not only green peppers but red peppers in my chili to make it colorful. Once it starts simmering it lets off an aroma that fills the whole house. This chili tastes great with sour cream, cheese, or my husband’s favorite – peanut butter crackers! Make sure to check out my other great recipes for other great ideas! Make Homemade Chili Seasoning Mixture and set aside. Cook beef until no longer pink and drain. Add in diced peppers, tomatoes, and onions and stir. Mix in tomatoes and chili seasoning mix. Simmer on low for about an hour or until vegetables are the desired texture. Stir frequently to prevent sticking. Serve with sour cream, cheese, or a side of peanut butter crackers. Enjoy! I’m not actually a chili fan, but this really looks good! I’d like to try! I love chili in the fall and am always looking for new recipes to try. Thanks for sharing. Definitely pinning to put it in my fall rotation! Ok this looks delish and I’m making it this weekend! Thanks so much for sharing!! Oh this looks so yummy ! Perfect for fall/winter seasons that are coming up on us fast! I love Chili! Thanks, bookmarking for later, looks so good!